I beggin my search on the ultra light Fiber trailler. I owned 2 Class B for 10 years, spend 6 months trip in 2013 in South Wesr and Baja California with my familly. My son will play in the USSDA next year with his Academy (Montreal Impact). We want to go and watch some of his game. So from Montreal all the games are between 300 miles to 500 miles one way! So need only something light, for highway. We need, bed, stove, fridg. Vsta potti is ok for us. 1) Do you think i can tow with the TDI? Not sure! 2) wich trailler have bed 75 inches or more? Here is somes pictures of our blog of our 6 months. Subject to confirmation, it looks like you might have a 2,000-lb towing capacity. In broad terms, I suggest this means looking for something around 1,000-lbs dry weight. There are several threads on that subject here. You can enter the terms 'under' and either 1,000 or 1,500 in the search bar on the right side near the top. There's also similar threads on the web. There are a lot of different philosophies regarding safety margin and that sort of thing. You'd also be well-served to learn about your vehicles gross and payload capacities along with your tongue weight and towing limits. A VW dealer can give you those numbers based on your VIN. After that, you should take time to read and learn about how they will impact your experience. This is interesting tinking that i can use my VW because love it! If we are only 2 and it'a for weekend use, we won't be to heavy. I can put 200 pounds on the hitch. I had a 2015 Jetta TDI with an automatic. VW does not have a tow rating for that one. After trying to find a tow rating so I could put a hitch on and pull my 300 pound motorcycle camper, I found out VW would not honor any warranty work if I had a hitch. Even if I put a simple hitch to carry bicycles, they would not honor it. I found several owners on VW forums who had transmission issues that VW would not repair because of the hitch. The CVT transmission is designed to carry passengers and luggage and nothing else. I got great mileage with that car, but the camper I could pull with an 1100 cc motorcycle sat for two years until they figured out their court settlement numbers. I have a different vehicle now. And a bigger camper. Never heard of a VW TDI with a CVT. I was under the impression they used dual-clutch automatics. Since the OP didn't say, it might also be a stick shift. Either way, though, check the owner's manual for towing information. The manual 6 speeds is rated 1000 on the ownet manuel, a it's realy conservative. I think 1100 +400 maybe 1500 would be fine. Drive slow in 5th speed could be easier like i already read. By the way, in Canada à Golf sportswagen is a Jetta in USA. Correction... CVT should have been DSG. I got so used to CVT's in previous cars, I forgot there was any other kind. "IMPORTANT: Towing a trailer of any kind with a vehicle that has a diesel engine and DSG automatic transmission will cause overheating and expensive engine as well as other damage to your vehicle that will not be covered by any Volkswagen Limited Warranty. Never install a trailer hitch on one of these vehicles." Here is the spec of a 2015 gas vs TDI. It doesn't say towing capacity anywhere. That's about what I expected. 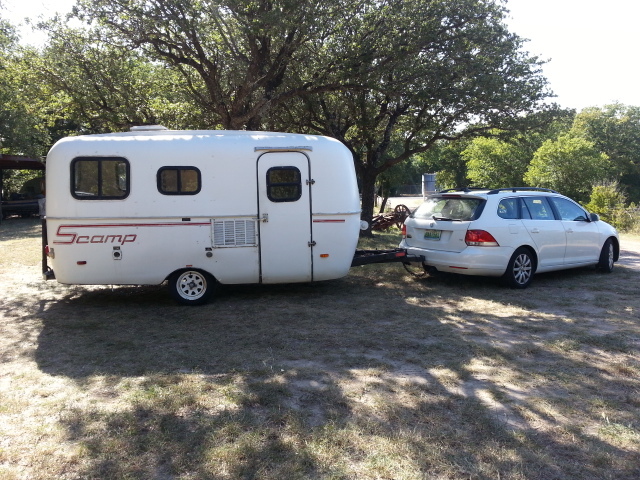 A number of folks have reported using Sportwagen TDIs to tow 13' molded trailers despite the low (or no?) rating. Most reported towing with manual transmissions and with only 1 or 2 people in the vehicle. Only you can decide whether it's worth the risk in terms of liability and warranty coverage to ignore the manufacturer's rating. 13' Scamps, Bolers, Trilliums, and similar usually have all the things you requested (some have an icebox instead of a fridge). Bed length is right at 75-76". One additional thing some do not have that you'll want is electric brakes on the trailer. Oh, and Sebastien, please give your son my congratulations for getting to the USSDA level. He must be very good, and you must be very proud of him. Check for other opinions on the TDI CLUB website. I towed for years with my 2009 and 2013 TDI Sportwagens. I installed the complete Euro towing package with trailer module. Not here in the US but in Great Britain it is rated 3600 lbs with a 200 lb tongue weight. With the VW TDI buyback I replaced the TDI with a 2016 Town and Country. Don't try towing with a VW without the Electronic Towing module that turns on the T-ESP or Trailer Electronic Stabilizer. The DSG works great and the Module also remaps the engine fuel and cooling curves and the DSG shift points. This will not fix the problem of no rating in the US even though the Sportwagen TDI has won best tow car in the UK several times. With a manual transmission I think you should be ok with a 13' egg like trillium or Scamp. Can-Am RV put a custom hitch receiver on a TDI and delivered bigger trailers all over Canada with it. Plan on driving with a light foot on the pedal. You help me a lot to save time and focus my searchs. So happy that i could keep my TDI WV, tow a 13 feet Scamp or trillium. I understand that i will have to put rhe right equipement for the hitch. So large bed and keep my TDI! Can someone tell me what do i have to instal on the car? There are few Us made hitches that I would consider to be adequate. The Westfalia and Bosal are good ones and mount as VW engineered. The drawback is that these are not receiver type hitches and have 1,97" (50 mm) balls. I let VW have two of these back on the buyback earlier this year. In my opinion you also need to install VW trailer module. P.F. Jones in the UK will sell you a setup for your TDI. There are many who don't think that the VW without North American towing ratings should be used for towing and looking here might not pay dividends for you. Here is a link to ID Parts for a Bosal hitch.